These offers are free with the purchase of the Atlas Weapon Single Shox 26 Multispeed (2014) Bicycle. The Atlas Weapon Single Shox 26 Multispeed (2014) features a steel MIG welded frame with an integrated carrier and suspension system. 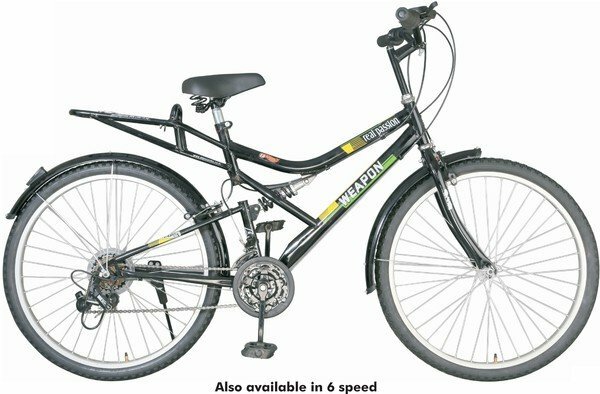 This bicycle comes with Shimano shifters and a 6-speed Shimano front Derailleur. It's 26" wheels, on 26T x 1.75 steel rims ensure a smooth, sturdy and comfortable ride. The Price of the Atlas Weapon Single Shox 26 Multispeed (2014) is Rs.6492. The Atlas Weapon Single Shox 26 Multispeed (2014) is a great intermediate bicycle for children aged 9 years and above, as well as young teenagers looking for a cycle for commute and fitness, and are looking to buy a second, entry-level, basic geared bicycle. 2. In what condition will I get the Atlas Weapon Single Shox 26 Multispeed (2014)? 6. How will I know if Atlas Weapon Single Shox 26 Multispeed (2014) will fit me without riding it? 7. How long will it take for me to receive the Atlas Weapon Single Shox 26 Multispeed (2014)?